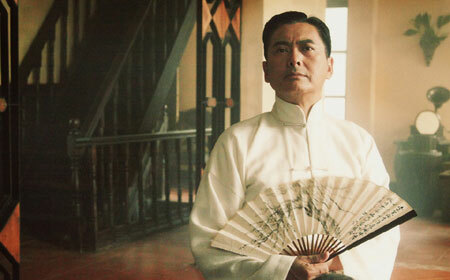 Chow Yun-Fat returns to Shanghai in The Last Tycoon. The Skinny: Competent and entertaining "tycoon" epic set in Shanghai features Chow Yun-Fat and the sort of iconography that should excite any longtime Hong Kong Cinema fan. Decent action and terrific production values help to shore up the flabby script and Wong Jing's unremarkable direction. OK commercial stuff for mass audiences. by Kozo: Golden Age Hong Kong Cinema fans, take note. The Last Tycoon brings Chow Yun-Fat back in the sort of role that once earned him a level of popularity rivaling the likes of Stephen Chow and Jackie Chan. Chow plays Cheng Daqi, a righteous gangster in 1930s Shanghai loosely based on real-life triad boss Du Yuesheng. Honorable criminals are common to this genre, but The Last Tycoon goes a step further by saying that Cheng Daqi does not trade in drugs, gambling or prostitution. He instead runs banks and nightclubs, which begs the question: how is this man a criminal? That SARFT-appeasing detail aside, The Last Tycoon offers Chow in a role rife with nostalgia. Not only is Chow playing a hero gangster, but he’s returning to the Bund, home of one of his most iconic roles: Hui Man-Keung from The Bund a.k.a. Shanghai Beach. This concept is so attractive that it almost doesn’t matter that Wong Jing writes and directs. There’s another Bund connection present in The Last Tycoon. Co-star Huang Xiaoming also played Hui Man-Keung in a mainland television adaptation of The Bund -- and the filmmakers push the “Huang Xiaoming is the new Chow Yun-Fat” idea even further by having the two play the same character here. The Last Tycoon opens in 1937 Shanghai with the older Cheng Daqi attending a Peking Opera performance, before flashing back to rural Chuansha in 1913 where the younger Cheng Daqi (Huang Xiaoming) receives his initiation into the criminal world. Jailed for a crime he didn’t commit, Daqi meets and makes a potential ally in Maozai (Francis Ng), a Nationalist military officer whose moral ambiguity contrasts with Daqi’s righteousness. With Maozai’s help, Daqi escapes imprisonment and heads to Shanghai, where he works under triad boss Hong Shouting (Sammo Hung). Meanwhile, Daqi’s sweetheart Ye Zhiqiu (Feng Wenjuan) pursues her dream of being a Peking Opera performer. The Last Tycoon jumps back and forth between Da Qi’s earlier and later days, with the past segments explaining how Daqi climbed the ranks to become a powerful gang boss who unfortunately didn’t marry his sweetheart. Yolanda Yuan plays Zhiqiu as an older woman, after she got married and become a big Peking Opera star, and frequent flashbacks explain her fallout with Daqi. The flashbacks also detail Daqi’s courtship and marriage to Bao (played by Kimmy Tong as a young woman, and by Monica Mok when older), and introduces his right-hand enforcer Lin Huai (Hu Gao, in the scene-stealing badass role). Maozai is also a frequent presence but his deepening corruption turns him from a potential ally into an obvious antagonist. The super big bad: the Japanese military (led by Yasuaki Kurata), which occupies Shanghai during the Second Sino-Japanese War and uses nefarious ways to control Daqi. But this is Chow Yun-Fat, so naturally Daqi don’t play that game. Eventually the past and present threads merge and we catch up with Cheng Daqi in 1937 at a crucial moment where all the film’s plot threads are set to explode. The ensuing climax is solid, but the buildup moves in fits and starts. The Last Tycoon has strong iconography and character types, but the story development is unimaginative and occasionally dull. The script is flabby, pausing for long moments where characters stroke their chins and contemplate things that the audience is already aware of. Daqi and Zhiqiu get strong focus but other characters are given short shrift, in particular Hong’s wife (Yuan Li), who’s treated with an importance that’s never really explained. Exposition is a problem; key plot turns are revealed in dialogue during static scenes usually involving people sitting around a table. A faster pace, more movement and greater urgency would help but Wong Jing seems content to guide the film in competent but unremarkable fashion. Chow Yun-Fat possesses solid charisma as Cheng Daqi and even gets a chance to cut loose with some minor overacting reminiscent of his emotional eighties work. Unfortunately, he has fewer opportunities to apply his trademark intense cool. This may be a consequence of his character’s age as those moments go instead to Huang Xiaoming, who mimics some of Chow’s mannerisms while offering his own trademark steely gazes. Casting Huang and Chow is a fine gimmick, but it seems unnecessary. Chow Yun-Fat is about 15 years too old for his role, and it’s a bit discomfiting that the film requires two actors to play Cheng Daqi, Ye Zhiqiu and Bao but not Maozai, Lin Huai or anyone else. This is an uneasy detail that may have gone unnoticed had the film been more impactful. Unfortunately, The Last Tycoon is an average product and the seams are easier to notice.